This post is sponsored by Walkers Shortbread. All opinions are my own. 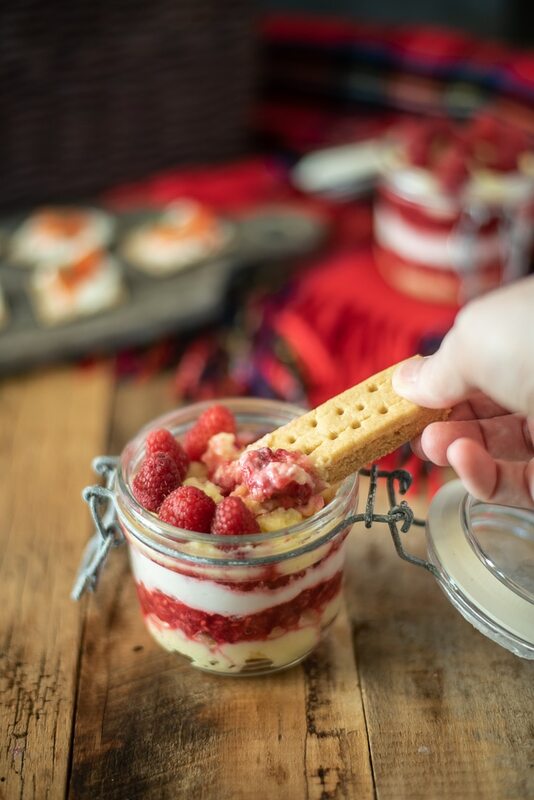 Scottish Raspberry Trifle Dip with Walkers Shortbread is the perfect summer dessert to take on picnics, road trips or entertaining. 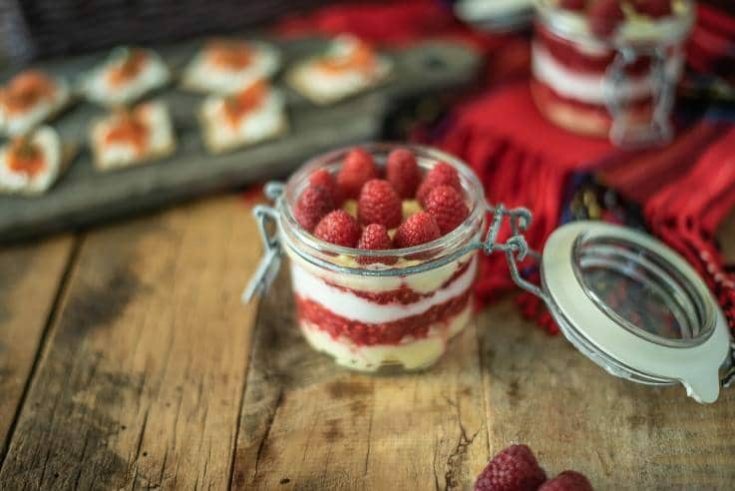 Fresh raspberries are sweetened and layered with creamy custard and sweetened whipped cream and it’s ready for dipping those shortbread cookies. Summer is here and I’m excited to be bringing you a delicious dessert dip that is tailor-made for dipping Walkers Shortbread. 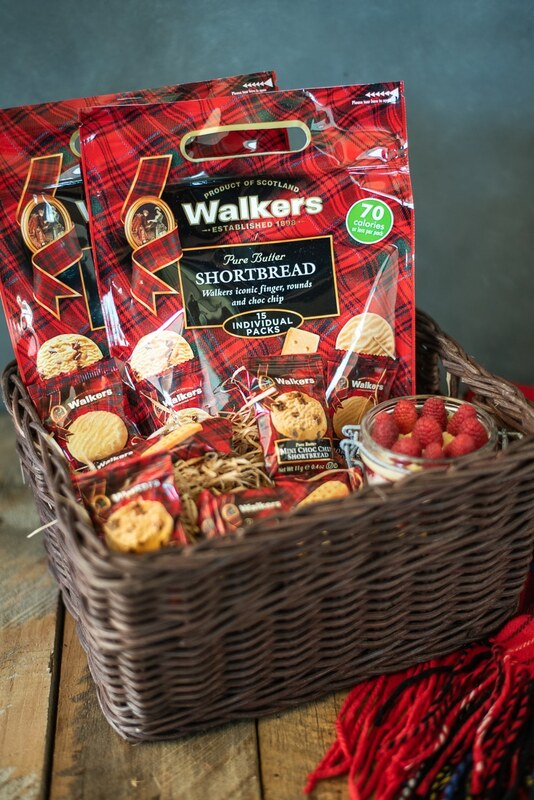 Walkers has been perfecting their shortbread since 1898 and are made in the Highlands of Scotland, so it’s only fitting that the dip is Scottish-themed too. What I’m loving right now are Walkers Assorted Cookie Snack Packs. They are individually wrapped and come in shortbread fingers, rounds and chocolate chip. This makes them perfect for packing into a picnic basket or taking on all those summer road trips we love. I also made the dip portable in sealable jars so everything travels well together. 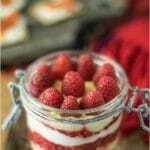 Scottish trifle (aka Tipsy Laird) is usually served on special occasions and holidays and in my eyes, summer is definitely special enough to serve this trifle dip. There are 3 steps when it comes to making the layers of this dip. The first step is making the raspberry sauce. Add fresh raspberries to a bowl with sugar and mash slightly to make them into a chunky sauce. This gets refrigerated until need. Next, heat whole milk with sugar and bring to a simmer. Eggs are whisked with corn starch and vanilla extract. Add the egg mix to the hot milk and whisked until thickened. Refrigerate to cool. The last step is whipping heavy cream with powdered sugar until stiff. Then it’s time to build the layers of the trifle starting with custard, raspberry sauce, cream, then repeat. How long will this keep? This dip will keep for up to 5 days sealed and refrigerated so it’s a great make ahead dessert. 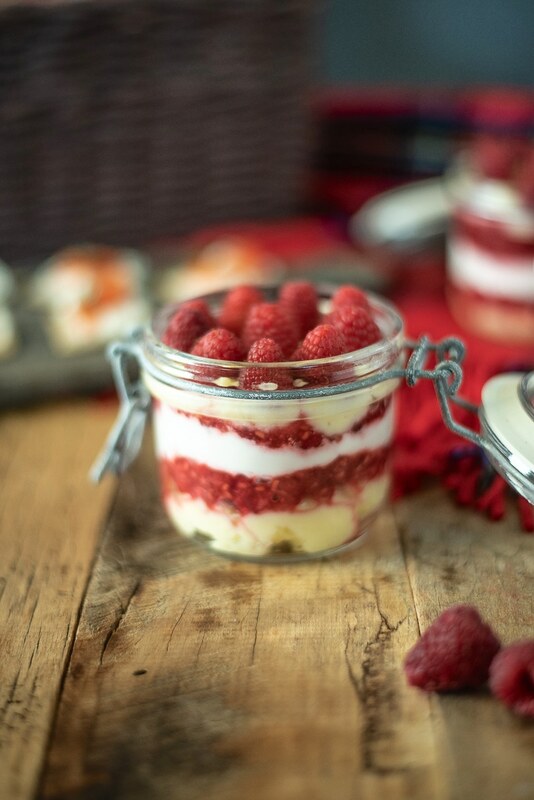 If you’ve tried this Scottish Raspberry Trifle Dip with Walkers Shortbread or any other recipe on the blog then don’t forget to rate the recipe and let me know how you got on in the comments below. I love to hear from my readers! You can also FOLLOW ME on FACEBOOK, TWITTER, INSTAGRAM and PINTEREST to see daily recipe updates. 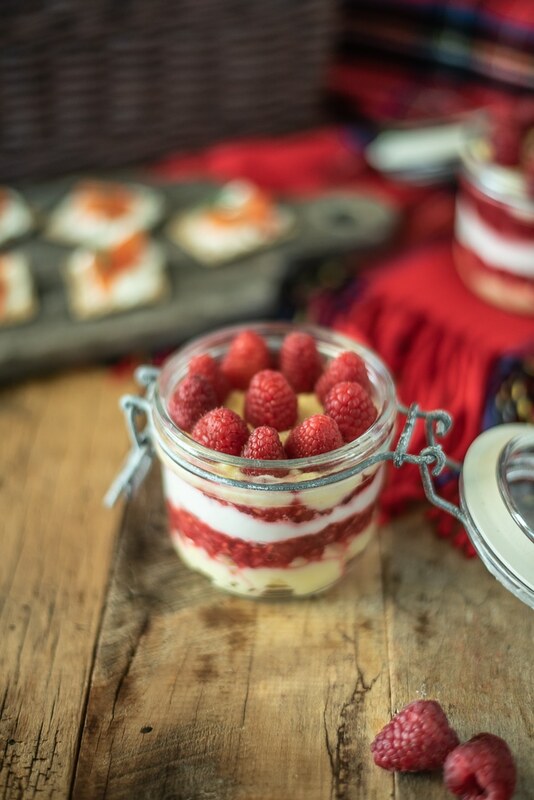 Fresh raspberries are sweetened and layered with creamy custard and sweetened whipped cream and it’s ready for dipping those shortbread cookies. Add the raspberries to a bowl and mix in the granulated sugar, mashing the berries to turn them saucy but still chunky, refrigerate. Add the milk and sugar to a small saucepan over medium heat and bring to a simmer. While the milk is coming to a simmer whisk the egg yolk and egg in a large bowl. Whisk the cornstarch into the eggs until dissolved. Whisk a little of the milk into the eggs to bring the eggs up to temperature. Pour the egg mix back into the pan with the rest of the milk, whisking over medium low heat, whisk until thickened. Transfer to a bowl, put plastic wrap directly onto the custard to prevent a skin forming and refrigerate. To a stand mixer or bowl using a hand mixer, add the heavy cream and powdered sugar. Whisk until stiff. To a glass bowl, layer with custard, raspberry puree and cream. Top with fresh raspberries. Dip your favorite Walkers Shortbread. I love all the layers of this, and as a Scot I would say Scottish raspberries are so good. Not sure I’ve seen this dessert but it looks tasty. I enjoy Walker’s shortbread. This is a great recipe for it – looks yummy! This looks so dreamy. Every layer sounds as delicious as the last! Never been so glad to come across a recipe and tick all the ingredients. Which means I can make it right now 😊! Thanks so much. This is gorgeous! I love raspberries. What a great looking step-by-step guide you have for this!